For all our friends in California, northern England, South Korea, Australia and dozens of other places that are too far from Erie to come for the Saint John's Bible Exhibit, perhaps this short virtual tour will give you just a little taste of this wonderful experience. Although copyrights prevent photographing the actual prints, links at the end will show you some of them on the web. Enjoy! "Wish you were here." A full page announcement in the Erie Daily Times inviting everyone in the Erie area to come to the exhibit. Upon entering our front door the exhibit times and introductory poster are displayed at the switchboard area. Pick up a guidebook at the long administrative hall where the prints begin. Some of the crowd on the opening day! Halfway down the hall is a showcase with samples of the vellum (calf skin), quills, and other project pieces. Turning the corner, the exhibit continues in the Chapter 57 hall. Chapter 57 hall from the other end. Two DVDs on the bible's production play throughout the exhibit hours. Displays in our giftshop, Chapter 57. A variety of books about the 10-year project, a DVD, beautiful 5x7 cards, as well as the bible books themselves are for sale. Five of the seven volumes are in print, the sixth is coming out soon and the seventh is just being finished. As awesome as we think these prints are, those who have seen the original pages at St. John's in Collegeville, MN, say they pale in comparison to the real thing. One of the primary reasons is the gold that was used in most of the illuminations. They say it just sparkles and glows in real life and seems to jump right off the pages. 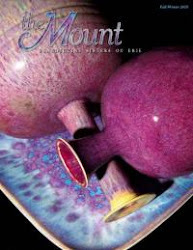 Our MOUNT magazine with its cover and feature story on the Saint John's Bible.